The clientele of Mahindra Truck’s could not speak any less about the company that they are doing business with. Each and every customer is very happy with the services being offered by Mahindra. Mr. H. R Khurana, MD Sheetal Parivahan, Mumbai speaks about how doing business with Mahindra Trucks has proved beneficial for him and his company. 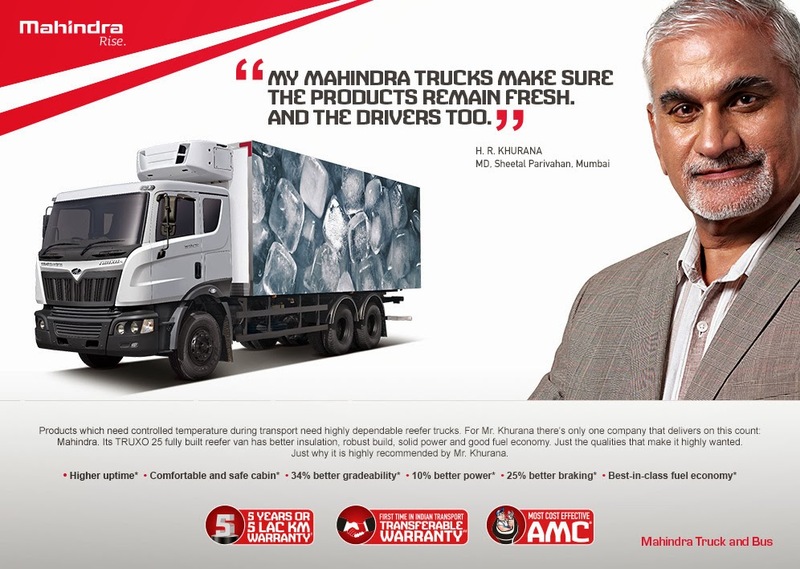 To quote Mr. Khurana, “My Mahindra Trucks make sure that the products remain fresh. And the drivers too.” No stone has been left unturned by Mahindra to make sure that their customers receive the best in terms of functionalities. Mr. Khurana has also added that products which need controlled temperature during transport need highly dependable reefer trucks and he also said that there is only one company that delivers on this account: Mahindra. Its TRUXO 25 fully built reefer van has better insulation, robust build, solid power and good fuel economy. It possesses all the qualities that make it highly wanted. And hence it is highly recommended by Mr. Khurana. According to him, Mahindra Trucks offer higher uptime, comfortable and safe cabin, 34% better gradeability, 10% better power, 25% better braking and the best-in-class fuel economy.